The Federal Highway Administration (FHWA) and the Federal Transit Administration (FTA) promote the use of an objectives-driven, performance-based approach to planning for operations as an effective way to integrate operations into planning and programming. This approach focuses on both short-term and long-term system performance, using established system performance measures rather than simply focusing on implementation of projects as a measure of success. It can be applied to both metropolitan and statewide transportation planning processes. The approach emphasizes consensus and collaboration across modes and jurisdictions and between planners and operators to help ensure that regional transportation investment decisions reflect the consideration of available strategies and approaches to meet a region’s transportation goals and objectives. An objectives-driven, performance-based approach to planning for operations is based on the concept that "what gets measured gets managed." Investments are made with a focus on their contribution to meeting regionally agreed-upon objectives. By implementing this approach, resources are allocated more effectively to meet performance objectives, resulting in improved transportation system performance. Linking planning and operations can improve transportation decisionmaking and the effectiveness of transportation systems by helping planners and operators consider the full range of relevant strategies to address regional goals and objectives. The recommended approach focuses on working toward desired system performance outcomes rather than just responding to problems. A more objective approach to addressing operations in the transportation planning process, allowing resource and investment decisions to be made with a clearer focus on outcomes. Increased accountability and measurement of performance. An objectives-driven, performance-based approach to planning for operations, shown in the figure below, includes the elements in the following list. It should be conducted in collaboration among planners, transportation providers, operators, and other stakeholders. Regional Goals. Establish one or more goals that focus on efficiently managing and operating the transportation system (in response to Federal requirements). Operations Objectives. Develop operations objectives —specific, measurable statements of performance —that will lead to accomplishing the goal or goals. Performance Measures. Using a systematic approach, develop performance measures, analyze transportation performance issues, and recommend management and operations (M&O) strategies. Management and Operations Strategies. 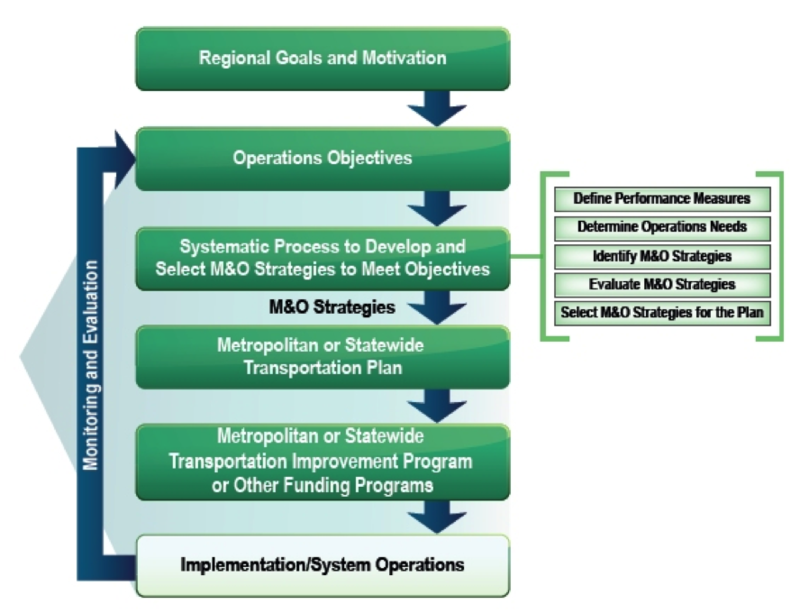 Select M&O strategies within fiscal constraints to meet operations objectives for inclusion in the metropolitan or statewide transportation plan and metropolitan or statewide transportation improvement plan (S/TIP). Investment and Implementation. Implement strategies, including program investments, collaborative activities, and projects. Monitoring and Evaluation. Monitor and evaluate the effectiveness of implemented strategies and track progress toward meeting operations objectives. Figure 1. Diagram of the objectives-driven, performance-based approach to planning for operations. The current Federal transportation legislation "Moving Ahead for Progress in the 21st Century" (MAP-21), signed into law July 6, 2012, advances statewide and metropolitan planning processes to incorporate a more comprehensive performance-based approach to decisionmaking. MAP-21 established national performance goals and State and metropolitan transportation plans will need to describe how program and project selection will be used to help achieve national goals. States and metropolitan planning organizations (MPOs) will be utilizing performance targets to guide investment decisions. MAP-21 calls for MPOs in coordination with State and public transportation operators to develop metropolitan transportation plans (MTP) and transportation improvement programs (TIP) through a performance-driven, outcome-based approach. It states that each MPO shall establish performance targets for tracking progress towards attainment of critical outcomes for their region. In addition, MAP-21 requires MTPs and TIPs to provide for the development and integrated management and operation of the transportation system. In particular, MTPs are required to include M&O strategies. The TIP is required to include a description of the anticipated effect of the TIP toward achieving the performance targets established in the MTP. The objectives-driven, performance-based approach to planning for operations provides MPOs and State DOTs a strong foundation for expanding an operations-focused approach to all aspects of performance-based planning required by MAP-21. See additional information in Policies and Regulations.